Cluse La Roche Petite Rose Gold CL40107 is an amazing and eye-catching Ladies watch. Case is made out of PVD rose plating while the dial colour is White. 30 metres water resistancy will protect the watch and allows it to be worn in scenarios where it is likely to be splashed but not immersed in water. It can be worn while washing your hands and will be fine in rain. The watch is shipped with an original box and a guarantee from the manufacturer. Cluse is named after one of the oldest watchmaking towns in France, Cluses, and its heritage of good quality watches continue today, with a stylish selection of ladies watches in a variety of styles and colours to match any wardrobe. Watch Shop is an authorised Cluse stockist. 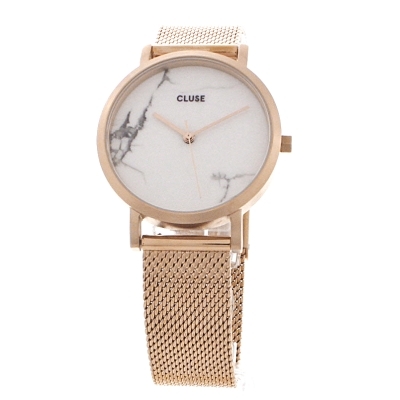 Sign up to receive email updates when new styles of Cluse are added to Watch Shop!